A bicycle accident can inflict devastating injuries and while compensation won’t fix everything, it may help reduce the financial burden of medical costs or treatments, lost earning capacity, as well as pain and suffering. 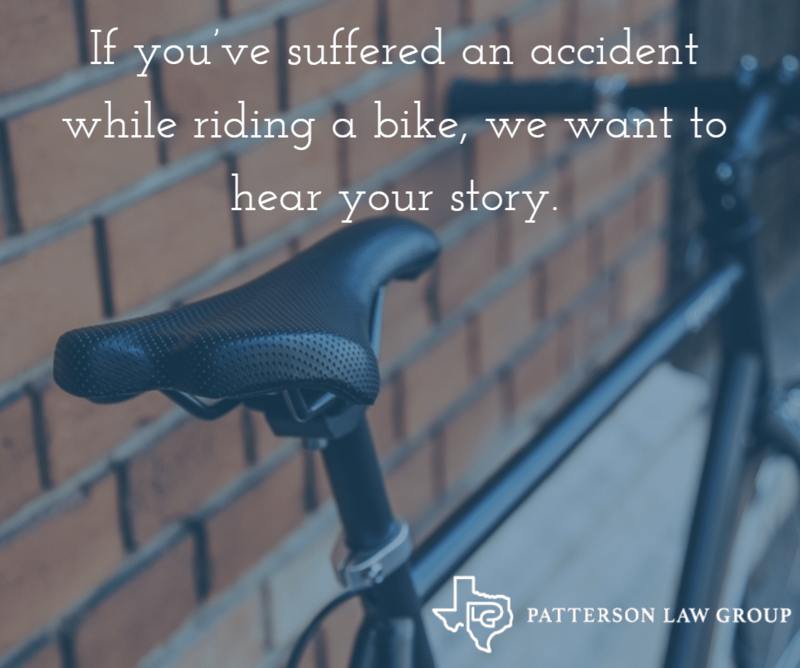 If you’ve been in a bicycle accident and you’ve suffered, we at Patterson Law Group want to hear your story. The NHTSA reports that most bicycle injuries are inflicted by motor vehicles, followed by faulty roadways, accidental falls or crashes, and occasionally, dog interference. Common injuries among those who suffered a bicycle accident include broken bones or fractures, brain injury, and even death. Each year, an average of 700 people die nationwide in bike/motor vehicle crashes. Another 49,000 reported injuries are sustained by those riding bikes. However, these national statistics are likely undervalued; in some states, including Texas, bicycle accidents are often only reported in the event of a fatality. At Patterson Law Group, we’re here if and when you need us. If you’ve suffered an accident while riding a bike, we want to hear your story. While it is certainly advisable to wear a helmet, no helmet can completely protect cyclists from drivers that are careless, drunk, or distracted. 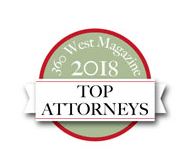 Bicycle accident lawyers in Texas take action on behalf of the victim, or their family, apprising them of their rights, and aiding in various legal challenges. 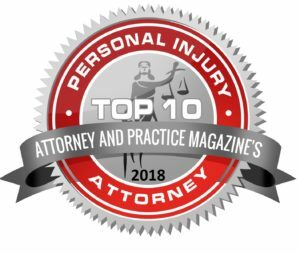 In Texas, we follow a 51% modified comparative fault rule; this means that an injured cyclist can’t collect damages if they are more than 50 percent at fault for causing the accident. An injured cyclist can collect damages if they are 50 percent or less at fault, but those damages would be reduced by degree of fault. Evaluating fault in a bicycle case can be tricky, which is why we want to hear your story first. According to the National Highway Traffic Safety Administration (NHTSA), bicyclists accounted for 2% of all traffic deaths, and 2% of all crash-related injuries in 2014. While it is everyone’s responsibility to drive safely and share the road, cyclists, in particular, should practice extra caution to avoid serious injury. Texas law treats bicycles as vehicles when they’re on the road; they share the same rights and responsibilities as enclosed cars and motorcycles, with a few small exceptions. Texas does not currently have a universal helmet law; it is legal for all persons to ride a bike without the use of a helmet. However, some cities like Austin, Houston, and Ft. Worth have enacted mandatory helmet laws for children under the age of 18. Environmental conditions also affect the safety of bicyclists on the road. For example, most bicycle fatalities occur at night, in urban areas, and often outside the safety of a designated intersection or crosswalk. Stay extra vigilant in these high-risk conditions. Helmets on cyclists have also proven effective at preventing serious brain injury and death. But despite our best efforts, Texas still averages 1.9 deaths per 1 million residents each year. At Patterson Law Group, we’ve helped cyclists find their footing after catastrophic events. 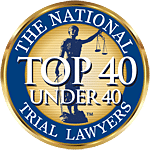 Our job is to understand your story, evaluate your case, and provide sound legal recommendations intended to help you and your loved ones through very challenging times. 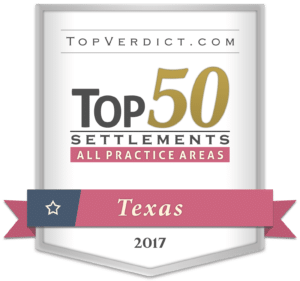 Contact Patterson Law Group today at 817-784-2000 or fill out the form on this page and we’ll get in touch with you shortly. Is the motorist always at fault for the bicycle accident? Motorists are not necessarily always at fault for bicycle accidents. Bike riders have responsibilities out on the road as well. Neglecting road responsibilities may lead a rider to be partially at fault for an accident. The court will weigh the evidence to determine the percentage of fault a bicyclist had and adjust the settlement amount accordingly. Does my auto insurance cover me in a bicycle accident? If you were involved in a bicycle accident with a negligent driver you will most likely recover damages from their insurance company. In certain cases, you may recover from your own insurance company. If your policy has personal injury protection, the coverage will almost always extend to bicycle accidents. You can talk to your insurer to find out if personal injury protection applies to your particular bike collision. Can I still file a lawsuit if I wasn’t wearing a helmet, did not have proper lights or reflectors, or was riding on the wrong side of the street? Generally speaking, you can still file a lawsuit against a negligent driver even if you were doing something you weren’t supposed to be doing at the time of the accident. However, your recovery may be limited by the percentage of fault attributed to you for the accident. While there is no statewide law requiring helmet use while cycling, (Ft. Worth requires helmets for riders under 18) the insurance company may argue that lack of a helmet contributed to accident injuries. The same goes for a lack of proper reflectors or riding on the wrong side of the street. An experienced bike accident attorney can review the facts surrounding your accident to determine who may be liable for your injuries. What are the most dangerous streets in Fort Worth to bike on? We analyzed every traffic accident over the past 6 years to find out which intersections are the most dangerous in Fort Worth. Using the data, we created a map to help visualize where most of the accidents happened. View our interactive map and filter accidents by year.